When we arrived at Arnada Cafe in Vancouver that evening, we found Son of Rust standing outside the club. They were obviously unsure of the welcome they would receive at Arnada. Arnada is a primarily rock oriented club catering to Vancouver, Washington locals. Son of Rust is a relatively new electronic band out of Beaverton, Oregon. Arnada locals generally arrive dressed in jeans and t-shirts. Son of Rust arrived dressed to perform... with 2 of the band members sporting white dress shirts with ties and black pants, the other in a black shirt with black slacks. A sort of 80's look in a somewhat 70's looking club. Not to worry, however. Son of Rust soon won over not only the locals in the club, but the club staff, and they most certainly got my attention the moment they took the stage. Son of Rust is s Justin Coope, Ben Purdy and Michael Pacheco. The set list for the evening included: Devil Inside Me, Silicon Gene, Rush, Strange, What Am I Now, I Can't Be Sane, This Time, Would You Live In, Stay 4 Ever, I Can't Wait, Common Ground, and Never. While experiencing some sound problems, their enthusiasm for performing came through loud and clear (unlike some of the vocals at times). It didn't matter. You could feel the energy and sparks this trio generates. This band could go places. 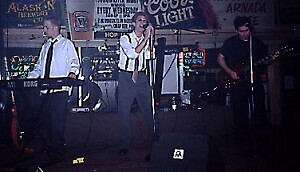 Alternating their time in the spotlight, the trio switches back and forth between vocalists, with each band member showcasing their talents and own unique styles. 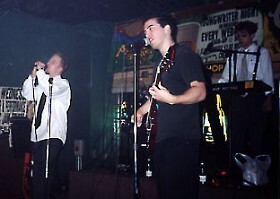 When Justin was on vocals, he was most decidedly industrial... Ben more melodic... and when Micheal took the stage, I was completely immersed in his soulful sounds. Eyes closed, rocking to the music, this beautiful young musician (who can't be much older than 18!) had me completely charmed. I turned to my companion and whispered, "he has IT". I describe "IT" as a sparkle, a presence, something special... but the best part is, he doesn't seem to KNOW "IT". That "innocence" of his not knowing the power he could have over an audience is very appealing. Son of Rust is a band that works very well together. While most of Sonof Rusts' music is written by Justin, other band members also contribute to the writing. Justin states, "Rush and This Time were written by Michael, Common Ground and What Am I Now were written by Ben. We each do the vocals for our own songs, and for live shows Michael and I play keyboards while Ben plays guitar. Michael also fills in on bass for songs that don't need keyboard accompaniment." I asked Justin about the equipment used in the set, and he replies, "well, we use a bunch of computers to generate the base music which we mix-down in our home studio and then record onto Mini-disc for the show. The rest of the music is generated by my Korg M1, Michael's Roland XP-60 and Ben's funky fresh guitar. As far as other audio equipment goes we have a couple of effect processors, a Mackie mixer and various microphones." I was curious about the band name, Son of Rust, to which Justin explains, "The name "Son of Rust" comes from a book by James Morrow called "Bible Stories for Adults". The story, specifically, was in regards to the future when the war between the anti-christ and god is not fought by people but by machines after they have come to replace the human race as the dominant species. The "Son of Rust" is actually the machine that embodies the anti-christ. Honestly the intent was to emphasize the machinery over mankind thing and not necessarily the anti-christ thing. Also, I just thought it was a cool name." Son of Rust has been together for about a year and a half. Justin has been writing music for about 6 years, Ben joined in a band format early last year (he's been writing music for about 5 years) and Michael about 8 months later. I left Arnada that night with a promise to return again soon. It had been a long time since I had been to a show there, and it was quite wonderful to find a fresh electronic synth band winning over the local Arnada crowd. I am looking forward to what the future might hold for Son of Rust.